The leg north from Salvador was rather uncomfortable, mostly beating into the wind and having plenty of rain. We’ve found that the first three days of a passage are most difficult as we are super cautious to try and prevent my seasickness (which means that Pete is graciously on full galley duty) and it takes us both some time adjust to the motion of the boat and the broken sleeping pattern. We covered the 604 nm in six days, pacing the boat so our arrival at Cabedelo, at the mouth of the Paraiba River, was in daylight and coincided with rising tide and inflowing current. One of the starboard channel markers with Joao Pessoa in the distance. Following the channel markers down the wide river, with a view of the skyscraper buildings of Joao Pessoa in the distance, we anchored in front of Jacara Village Marina at 07:15. After a difficult passage it was a rather strange feeling to have sudden peace and calm, without motion or sound. The six days that we spent at Jacara Village, on the outskirts of Cabedelo, were quite pleasant. Every evening, at sunset, we watched the passing parade of big pleasure boats with their festive Brazilian music and joyful, dancing partymakers. We have come to realise that the Brazilians love loud music! There were four other South African boats in the anchorage and we invited them all over for a sundowner party on Moondust one evening. Since they were all on monohulls, they marvelled at the space. We joined the birthday celebration of Oloff, one of the crew on “Ongemak”, at the marina. From the left are Zelda, Oloff, Muir and Ronell. We stocked up the larder, completed the inevitable maintenance jobs and said goodbye to our new found friends, hoping to meet up again. With the help of a nice breeze and the ebb tide current we were soon at sea and turned north. The winds averaged in the high teens for the first few days and we quickly rounded the bulge of Brazil, then headed north west, picking up a favourable current at last. Around Fortaleza the wind peaked at around 20 knots, with short steep seas, but we were fine with shortened sail. All in all it was a pleasant voyage, with little rain, and most importantly, I didn’t get seasick. Pete had read about a very interesting island, Ilha dos Lencois, just north of Sao Luis, and it didn’t take much persuasion to stop by. Well, it wasn’t quite as easy as that, as we were cruising nearly 200km offshore and, beginning two days prior, had to carefully plan our speed and hence our arrival in Lencois Bay in daylight, two hours before high tide, to make sure that we wouldn’t get stuck on one of the sandbanks that surround the island. Moondust anchored at Ilha dos Lencois. This amazing island warrants a blog post on its own, so suffice to say for now that our four day stop at Lencois was perhaps the most special of our trip thus far, for reasons of natural beauty and unspoilt people. The only downside was the tiny black fly which left us covered in itchy bites for days afterwards. Pete having a chat with some of the local fishermen. We would have loved to stay longer at Lencois but I didn’t want to risk losing my sea legs. After our six day stop at Cabedelo I was 95% okay and thankfully after out stop at Lencois I was 100% once at sea. It seems that five day stops may be my limit, if the seas aren’t too boisterous on sailing again. For the first four days after we left Ilha dos Lencois we had a gentle breeze of 5 to 10 knots and sometimes a current, both from behind, to push us along nicely. Then the wind dropped almost completely, however, thanks to the strong Equatorial current we still made headway towards French Guiana and thoroughly enjoyed our peaceful passage on the violet blue ocean, with plenty of flying fish gracefully skimming the waves around us. Sargassum, a sea weed, which almost looks like golden tinsel. After we passed the mouth of the Amazon River, about 250km offshore, we encountered patches of floating sea weed which played havoc with the fishing line. This stayed with us all the way to Tobago, where tons of it had washed up on the Atlantic side of the island. We later learned that it is Sargassum, a sea weed which provides food, refuge and a breeding ground for fish, sea turtles, birds and other sea creatures. On one of the calm days a pod of dolphins joined us for about half an hour, swimming along at our bow and entertaining us with some high jumps. A dolphin entertaining us with a high jump. We lost two lures and a shark snapped off the body of one fish, leaving us only the head. We did, however, manage to catch a Spanish Mackerel and a beautiful Dorado, the latter with one of Pete’s homemade lures. Off the coast of Suriname most of the fishing boats we came across were quite curious and came up close to wave us a friendly and welcoming ahoy. From their reactions they don’t see too many sailing boats out here. Sadly, a few days before we reached Tobago, we lost our favourite sail, the colourful genneker which is great for light wind sailing. One night, just as I lay my head on the pillow, I could hear something was wrong and after Pete switched on the deck light I could see colourful pieces flapping wildly in the wind. She split from top to bottom in only a 12 knots squall, albeit from the beam, which may have stressed a weak point and started the tear. We had to bring her down and hoist the main sail and genoa in the dark. When I encountered a gust of 20 knots later on my night watch, I was relieved that it wasn’t up anymore. Our colourful genneker, shortly before we lost her. For the rest of our passage to Tobago we had good wind and the strong current which got us there quickly. In fact, on the last day we had to reduce sail to ensure that we arrived early the next morning rather than that night. 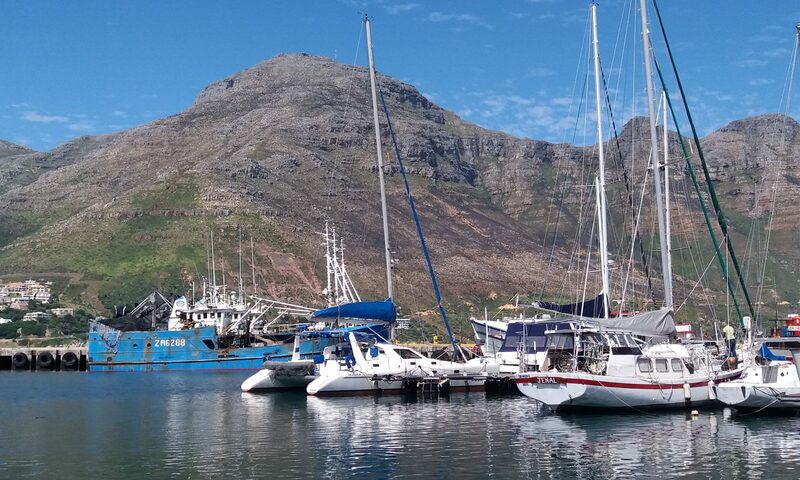 On 12 July, after rounding the rugged, picturesque north end of the island we dropped anchor in Pirate’s Bay. Finally we were in the fabled Caribbean! Lovely catching up with the latest news. Great to hear all your news – what an amazing time you are having! Glad to hear that Karin is getting over her seasickness! Thanks Sue for keeping in touch. Fortunately the seasickness ‘only’ lasts three days at the start of each new passage, unless I manage to keep my sea legs. Hi Peter and Karin, thanks for the update . Your both must be loving it . Sorry to hear about you Gennaker . Hopefully you can find one from one of your sailing mates . There are quite a few boats out there that may have the similar size Gennaker and you could buy 2nd hand . Its either that or buy new . Have you got the size of the old Gennaker . Luff length leech and foot length . I can always get to send you a quote, so you know what pricing is around . Chatting to Glen who shares my office with me , says that he did lots of sailing around that area between Charlotteville and Puerto La Cruz all along that Northern area of Venezuela . Says one needs to be cautious as well speak to all the yachties , always to good to chat . Im sure you both do . We are all very jealous and would love to be there with you both . Wishing you both great sailing and keep those messages coming . Thanks for your comments. We’ll mail you the size of the old sail as it will be nice to get some reference on what to expect. Best regards to all in Cape Town. Oh what a sumptuous update! Thank you for the maps and video clips too. It gives a fabulous feeling of actually travelling with you. You sound like such professional sailors, I am in awe. So sorry to hear about your loss of the colourful sail. Of course it was my favourite ha ha. Back here at home we have had some good rains and hope for more. Sending you both love and fair weather. Keep the reports coming. They are great escapes for us. Re the no see ums small flys that bite. We have found that a spray bottle with a weak solution of dettol and water keeps them at bay. A fresh water shower keeps the bites from becoming blisters. Pete can you make me some lures for my next moz trip. Nice to read your story and see the photographs and video’s. Wonderful world. I hope you can replace the lost sail. Probably there are a lot of sailors in the Caribbean so it should be possible. Telling fromthe video of the cruising ship they know how to make a party over there. Keep well, and maybe see you both in November in Grenada. Hi Peter and Karin, amazing how far up Brazil that you sailed, I know it is a big country but still. It looks like your seasickness may be coming to an end Karin, lets hope so. Why do you cruise so far from the coast?. Now you are in the Caribbean are you planning to go through the Panama Canal it is much more scenic than the Suez or Keel canals as it has a lock on each end and for the rest of the trip you are in open water and will take more than a day.Our favourite island in the Caribbean was Grenada, and Curacao. Keep enjoying yourselves and be careful. Barrie, we cruised that far out to be in more than 100 meters of water depth so that we could avoid most of the Brazilian fishing boats that anchor in the shallower water. They are very difficult to see and therefore quite a hazard, particularly during the day. We intend cruising the Caribbean for the next few months and then go through Panama. We do intend stopping at Grenada, so we’ll think of you when we do. As always, seems like you are once again on the move. We haven’t touched base with each other in many years. I was in touch with Rick the other day, and he mentioned your trip. So, I thought I would drop in and take a peak. One hell of a trip you are taking. Obviously the experiences of your Mum and Dad on Rebel had an influence on you. I am assuming that you are still on this cruise? Anyway, best of luck to you and Karin, and I hope you get this message. Heather & Ian Raynor (your long lost cousin! ).